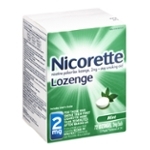 Active Ingredient (in Each Lozenge) - Purpose: Nicotine Polacrilex, 2mg - Stop Smoking Aid. Inactive Ingredients: Acacia, Aspartame, Calcium Polycarbophil, Corn Syrup Solids, Flavors, Lactose, Magnesium Stearate, Maltodextrin, Mannitol, Potassium Bicarbonate, Sodium Alginate, Sodium Carbonate, Soy Protein, Triethyl Citrate, Xanthan Gum. Warnings. If You Are Pregnant Or Breast-feeding, Only Use This Medicine On The Advice Of Your Health Care Provider. Smoking Can Seriously Harm Your Child. Try To Stop Smoking Without Using Any Nicotine Replacement Medicine. This Medicine Is Believed To Be Safer Than Smoking. However, The Risks To Your Child From This Medicine Are Not Fully Known. Do Not Use. If You Continue To Smoke, Chew Tobacco, Use Snuff, Or Use A Nicotine Patch Or Other Nicotine Containing Products. Ask A Doctor Before Use If You Have. A Sodium-restricted Diet. Heart Disease, Recent Heart Attack, Or Irregular Heartbeat. Nicotine Can Increase Your Heart Rate. High Blood Pressure Not Controlled With Medication. Nicotine Can Increase Your Blood Pressure. Stomach Ulcer Or Diabetes. Ask A Doctor Or Pharmacist Before Use If You Are. Using A Non-nicotine Stop Smoking Drug. Taking Prescription Medicine For Depression Or Asthma. Your Prescription Dose May Need To Be Adjusted. Stop Use And Ask A Doctor If. Mouth Problems Occur. Persistent Indigestion Or Severe Sore Throat Occurs. Irregular Heartbeat Or Palpitations Occur. You Get Symptoms Of Nicotine Overdose Such As Nausea, Vomiting, Dizziness, Diarrhea, Weakness And Rapid Heartbeat. Keep Out Of Reach Of Children And Pets. Nicotine Lozenges May Have Enough Nicotine To Make Children And Pets Sick. If You Need To Remove The Lozenge, Wrap It In Paper And Throw Away In The Trash. In Case Of Overdose, Get Medical Help Or Contact A Poison Control Center Right Away. Phenylketonurics: Contains Phenylalanine 3.4 Mg Per Lozenge. Not For Sale To Those Under 18 Years Of Age. Proof Of Age Required. Not For Sale In Vending Machines Or From Any Source Where Proof Of Age Cannot Be Verified. Tamper Evident Feature: Do Not Use If Clear Neckband Printed "sealed For Safety" Is Missing Or Broken. Retain Outer Carton For Full Product Uses, Directions And Warnings.